A root canal is a dental procedure on the root of your tooth. The procedure may be recommended when a person has severe tooth decay, a cracked tooth or a severe injury. Although a general dentist can do a root canal, it is usually performed by a specialist in endodontics. An endodontist is a dentist who has had additional training in surgery and treatment of the tooth’s roots. Endodontists have two or more years of additional training after earning a doctor of dental surgery (DDS) degree from a dental school. Their specialty is saving natural teeth. Understanding root canals, what the procedure is and when they are needed helps a dental patient feel more comfortable about the procedure. A person may need a root canal when a tooth has serious to severe decay or damage. A cavity that has reached the pulp of the tooth could lead to inflammation, pain and infection. Without treatment, that infection could spread to the gum tissue and jaw bone. 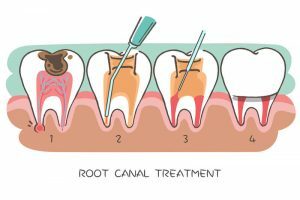 The root canal procedure removes the inflamed pulp, fills the tooth’s root, treats any infection and restores optimal health to the tooth. An injury may also necessitate a root canal procedure. A tooth that experienced a direct hit or impact may crack or chip, exposing the root. Trauma even without a crack or chip could injure the tooth’s pulp. Performing a root canal saves the tooth and eliminates the pain caused by irritation of the tooth’s nerve. The tooth can remain healthy because the surrounding gum tissue nourishes it. The news that a root canal is needed used to be a most unwelcome bit of information. While the procedures of 20 or 30 years ago used to require several visits and a considerable amount of patient discomfort, today’s root canal procedures are quick, efficient and pain-free. The root canal procedure is straightforward and has just a few simple steps. To begin, the endodontist uses a local anesthetic to numb the area. If a patient requests sedation, the intravenous line is started about 15 minutes before starting the tooth surgery. Once the area around the tooth is numb, the endodontist uses a small tooth drill to access the pulp. Tiny dental instruments are inserted into the tooth. The pulp and nerve are removed. The tooth’s root is cleaned and disinfected. The endodontist inserts a rubbery material called gutta-percha into the tooth’s root. If the tooth has more than one root, this is repeated for each root. The tooth is sealed shut. In most cases, a temporary crown is placed onto the tooth in order to protect it. Many teeth that have had a root canal procedure need a crown. This is the case if the tooth had severe decay or a crack that damaged its enamel and dentin structure. The crown restores the tooth’s weakened structure. Crowns are custom-made for the patient using impressions taken by the endodontist or dentist. The crown may be made of gold alloy, porcelain fused to gold or a composite material of resin and porcelain. The crown fits over what remains of the natural tooth’s structure. During the root canal procedure, the endodontist numbs the quadrant of the mouth where the affected tooth is located. Most patients do not feel anything. A few patients will just feel some pressure or a slight pulling sensation. The numbness lasts for 30 to 60 minutes after the work is done. The root canal procedure removes the nerve from the tooth’s root. There will be no pain from the tooth. With a temporary crown, patients should avoid very hot, crunchy, chewy or sticky foods. Once the custom-made crown is ready, the patient returns to the office to have it cemented in place. The dentist checks the fit of the crown, and small adjustments can be made in order to ensure a comfortable fit. Root canals are highly effective, and more than 95 percent of people have a successful procedure. When a person needs root canals Mansfield OH, Dr. Russell Kiser is the natural choice. He is a certified EMS provider and is trained in conscious intravenous sedation dentistry. As both a general dentist and an endodontist, he is adept at the care of the tooth’s roots and saving natural teeth. Make an appointment today or call the office of Dr. Russell Kiser to learn more about root canals Mansfield OH. "Dr. Kiser and his staff are all just wonderful. They make you so comfortable at each visit. Dr. Kiser is very caring and understanding. He goes over everything in detail and makes sure you leave very informed. I would recommend his office to everyone!"